All details of information you need to know about French regulations and business behavior. Is Firing in France as difficult as it is said? You have recently hired an employee using a permanent contract. Unfortunately, her/his trial period is over and her/his achievements are below expectations. How can you separate at minimum costs to the company? Providing you with the first tips how to deal with the issue requires to prepare the legal background before dealing with the stake and finally the behaviour to use. There are legally 3 ways to end a relationship with an employee. Except in the case of an employee who has committed a serious fault (faute grave), redundancy is the best option , and especially if the employee has been with the company for a long time. In the eyes of the law, the damages and severance pay for redundancy depend on how long the employee has worked for the company. If they have been there for less than a year, the damages will amount to 1-2 months’ pay. However, after 2 years of service these damages can rise to 5 or 6 months of salary. Severance pay for the employee is small. To avoid the unfortunate consequences for the employer of a court case, the parties can come to a settlement immediately following a redundancy. This agreement removes any possibility of the employee taking legal action thanks to the payment of a negotiated amount of severance pay, which is often inferior to what an employment tribunal would award. Finally, since 2010 there has been the option of the ‘rupture conventionnelle’, through which the parties sign a mutual termination agreement to cease contractual relations. The main advantage of the ‘rupture conventionnelle’ is that it is a lot less costly than a settlement. But the other side of the coin is that it provides a lot less security for the employer. The employee still has the right to bring the employer before an industrial tribunal, arguing that the employer forced his or her hand. 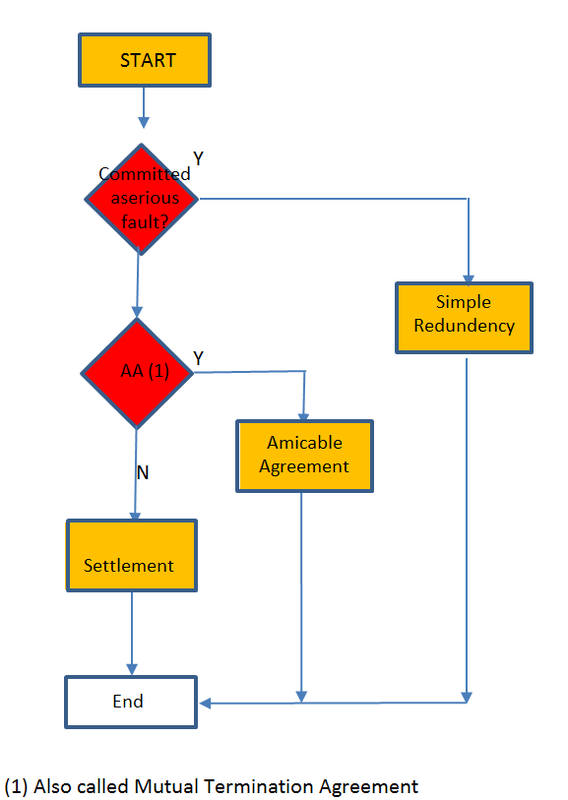 To remove the possibility of grievances after the conclusion of a ‘rupture conventionnelle’, some lawyers used to propose adding a settlement to the latter in order benefit from the financial advantages of a ‘rupture conventionnelle’ and the legal advantages of a settlement. But this practice was banned by the labour chamber of the Cour de Cassation (France’s highest court of appeal) on 25 March 2015. The ‘rupture conventionnelle’ cannot be followed by a settlement. Also note it is strongly recommended not to negotiate a mutual termination agreement if the employee a protected status (such as trade-union representatives, etc.). The main risk is to keep on the employee, hoping that he will make progress and overcome his shortcomings. In reality, if at the end of a year the employer’s efforts are in vain he will probably we forced to pay damages and severance pay that is a lot larger while he will have spent a lot of energy and time in trying to improve the employee’s performance. And the employee will be just as frustrated. So the essential question is to know if the employee is has it in him to improve – in short, if he will be better today than tomorrow. In consequence, it is important when supervising an employee to understand the kinds of errors they commit. And even though they admitted to making them, it is still not enough if they reoffend . Push him into a corner by applying the strategy of ICHIKWA – in other words, until the employee reveals the deep nature of his error. Because this pressure should result in one of the 4 following responses: I don’t care (or I am not motivated), I don’t want to do it, I don’t know how to do it, I have a serious personal problem (objectivity). This will allow you to broach the subject of their leaving and how that may be done: ‘rupture conventionnelle’ (if he says he is not motivated) or redundancy followed by a settlement. How do you negotiate a salary in France? When does the employer have to pay their employee? Which type of American company does the SARL or SAS stand for? The net salary is always after deduction of payroll taxes, but before deduction of income tax. In France, as opposed to many countries (USA, Canada, UK, Northern European countries, Germany), income tax is not prepaid by the employer. It’s separately paid directly by the employee the following year. Unless specified, when negotiating a salary in France gross salary is always implied. And it is this gross salary that is mentioned in the employment contract. Nonetheless, nothing prevents the parties from negotiating a net salary, as is the practice in some countries (USA, Germany). Moreover, this practice has been growing in recent years. However, the hiring company will have to calculate from this net salary a gross salary that will be mentioned in the employment contract. In order to find the gross salary, the net salary must be divided by about 0.77. The salary is always paid at the end of the month, except in some cases (resignation, dismissal, end of a contract). Pay slips are the size of a novel!The reason: as opposed to many countries, there is not only one body that collects payroll taxes; the company is in charge of redistributing the amounts to each beneficiary body. However, since the beginning of 2011, the collections from URSSAF (health and retirement) and POLE EMPLOI (unemployment benefits), the two major insurance funds have been unified. Welfare taxes are paid monthly unless the company employs less than 10 people, in which case they are paid quarterly. Since the taxes are collected from both the company as well as the employee, they represent 88% of the net salary. It is a large amount that surprises many foreign companies’ CFOs at the start of an activity in France. The VAT, as its name implies, is the tax collected at each step of the value chain. Consequently, every company is subjected to this tax. The VAT charging mechanism on purchase and sales make the VAT neither a burden nor revenue for companies. However, the VAT is a cost to the final consumer. It is not the case of State sales tax in the USA, which in its principle is also a tax on the final consumer, but only some activities are liable and the rate varies from State to State. In principle, the VAT is paid monthly. Companies whose turnover is below a certain amount can pay it quarterly. France has a very centralized administration; companies only have one income tax return to fill, and pay corporate tax solely to the French State. In other words, there is no income tax return to fill or to pay at a regional, provincial, Lander or departments’ levels, as opposed to federal states (USA, Canada, Germany) or confederate states (Switzerland). Thanks to the generalization of information technology it has been possible in recent years to declare and pay corporate tax and most payroll taxes paper free. For companies beyond a particular size, the use of electronic documents to pay VAT, corporate tax or CVAE (cotisation sur la valeur ajoutée des entreprises) is even mandatory or else a fine can be issued. In France, payment terms extend from 30 to 90 days. They are twice as long as in northern Europe and North America. For high value-added companies, this means an important working capital requirement, since employees are paid monthly and payroll taxes often paid quarterly. If wire transfers have a more and more important role in financial transactions between companies, checks remain a largely used means of payment. The reason being: checks are a means of payment that benefit from a strong legal protection in France, as opposed to other countries (USA, Canada in particular), where checks are a non protected means of payment. Indeed, issuing a bad check is severely punished in France. Unlike many countries, check processing is free for the issuer. And they are not returned after payment. In return, the bank accounts don’t receive interest. For small transactions, the use of the credit card is very widespread. Consequently: You should expect that the sales people of your future French subsidiary will ask for a personal credit card (called so because the company’s account is debited at the end of the month). However, French people don’t like to carry cash as opposed to northern Americans, Germans and other Northern countries. Most businesses won’t accept bills over 50€. In France, retail selling businesses benefits from a legal protection. Hence, it is possible to mortgage it for a credit. If you have other questions about business practices in France, please contact us.